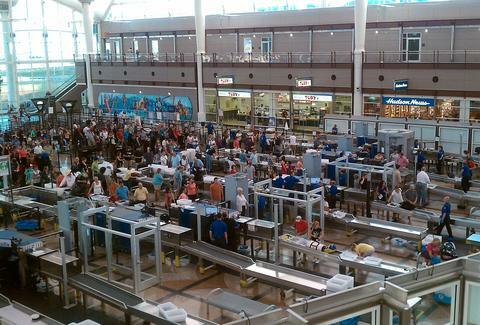 You won't be all by yourself at Las Vegas' McCarran Airport on Independence Day this year. On the contrary, with a staggering 11,423,852 arrivals (and just 1,485,948 departures! ), the airport is pitted to be the most crowded in the US, according to a study by travel startup Hopper, which collated stats on more than 1 billion booked flights and more than 10 million flights passengers have searched for. Here's an animated map showing the anticipated flow of airport traffic, on a scale of blue to red, courtesy of Hopper. The bluer an airport, the calmer it will be; red means it's hella packed. Other airports to avoid if you're booking a last-minute ticket for the Fourth of July include (in order of their popularity): Los Angeles International Airport (expected to have more than 5.6 million arrivals); Hartsfield–Jackson Atlanta International Airport (more than 5 million departures and over 4 million arrivals); Chicago O'Hare Airport and Denver (expected to have more than 4 million departures and arrivals apiece). If you're hoping to beat the lines in a major airport, you can't beat Phoenix Sky Harbor International Airport for the holiday, where 1.9 million arrivals, the least among the survey, are expected. Maybe it's time to make an ASU campus visit? As Patrick Surry, Hopper's chief data scientist told CNBC, several of the most popular destinations that appear in this year's study are the same as last year -- though the cost of flying has risen by around 15 percent. Nevertheless, as you'll see in the full breakdown of the busiest airports here, a lot of people are flying. And one thing's sure to follow: A lot of people will be complaining.